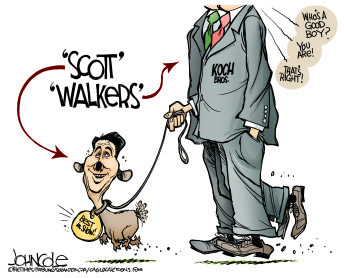 Scott Walker, “the goggle-eyed homunculus hired by Koch Industries to run their Midwest subsidiary formerly known as the state of Wisconsin,” will announce that he is running for president on Monday. And we are still waiting on the Wisconsin Supreme Court to rule in three cases in the summer of 2015 that will determine whether the “John Doe” investigations into illegal campaign coordination, and separate but related criminal investigations initiated by Milwaukee County prosecutors, can be revived or must be ended for good. John Doe Investigations – Milwaukee Journal Sentinel. This guy reminds of Richard Nixon more than any political in the past 40 years.